Mui Ne, Phan Thiet is one of the major tourist destinations in Vietnam, a truly beach paradise blessed with blue ocean, red sands and strong winds. Lying on the southern central coastal line of Vietnam, just ten kilometers away from Phan Thiet city’s centre. Has been called by many nicknames such as ‘the resort capital of Vietnam’, Mui Ne used to be a fishing town before the 90s. However, Mui Ne is so much more than just a resort destination. The natural beauties of Mui Ne lies beyond the beach and the local rustic life is still preserved. The main beach or the most famous beach in Mui Ne, often called by foreign tourist ‘Mui Ne Beach’ has its actual name Bai Rang or Rang Beach. This beach is indeed the most beautiful beach near Mui Ne. 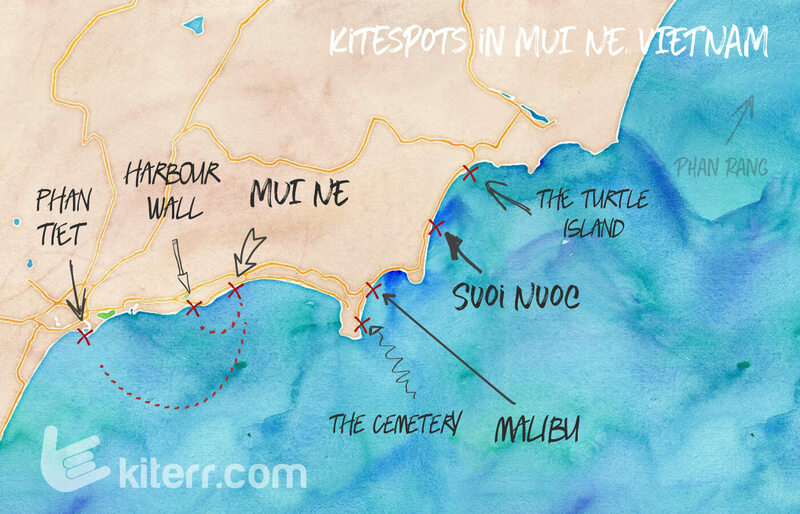 Yes, you read it right, Mui Ne beach is not even in Mui Ne ward, but in Ham Tien ward which lies west of the town. However, thanks to the highly developed and centered accommodation and tourism services of this beach, Bai Rang took the crown as the beach that represents Mui Ne. In fact, Mui Ne has two beaches: Ganh Beach and Suoi Nuoc Beach, both with a number of resorts and few shops and restaurants. What makes ‘Mui Ne Beach’ so special to travelers? 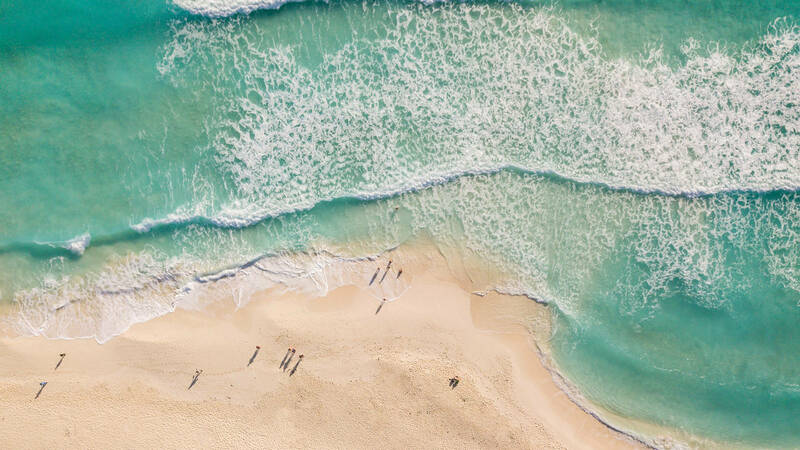 The beach stretches over 16 kilometers of white, soft sands and turquoise water and endless sunshine. 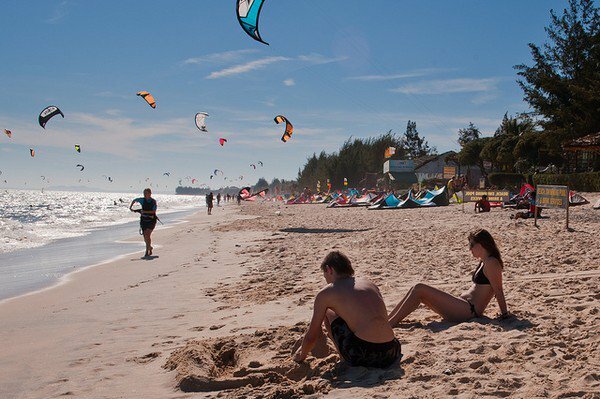 The strong winds make it the wonderful place for kitesurfing and windsurfing. Much of the year, Mui Ne stays hot and dry with stable strong winds – a weather so favorable for water sports and beachside activities. As some of the most stunning tourist attractions in Mui Ne, Hon Rom is a small island still connected with the mainland. The island is the outermost point of Mui Ne, has been given a Straw Island because the color of the special species of grass on grown on the island. There are two beaches on Hon Rom Island: Hon Rom 1 and Hon Rom 2 with the total stretching length of 17 kilometers long. The two beaches have pristine beauty and serene atmosphere which other beaches in Mui Ne don’t. 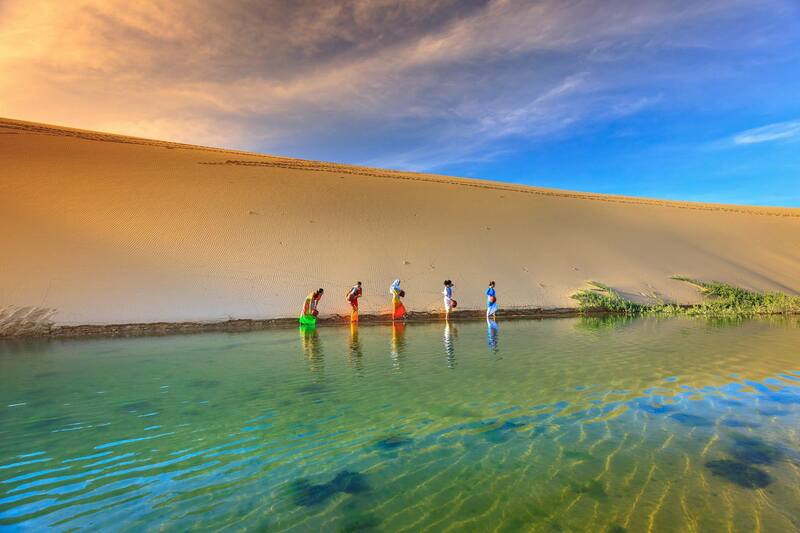 There are countless Fairy Streams in Vietnam but the beauty of Fairy Stream in Mui Ne is singular. It has physical feature like those of an alien planet that only exists in a sci-fi movie. The stream is located next to Hon Rom island, created with two parts that are contrasting in colors: the sand hill is flaming red and the forest is lush green. These two parts are divided by a clean spring of water, only ankle deep. Take off your shoes and slowly wade through the stream to feel the cool water and soft sands flowing through your feet while admiring the nature surrounding you. 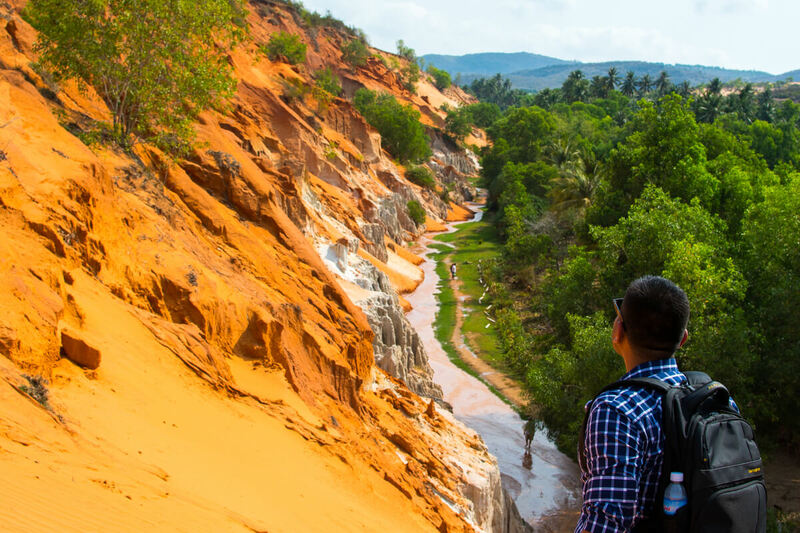 Fairy Stream is one of the must-do things in Mui Ne Vietnam. Bau Trang or White Sand Dunes is about 27 kilometers north of Mui Ne town. From afar, Bau Trang looks like an oasis in middle of a white desert. The lakes in Bau Trang are the only two freshwater lakes in Binh Nhon commune. Legend has it that in the past, there used to be just one large lake, until the local people made a dike divided the two lakes. At the time, locals only call this site “Bau” because in local accent, “Bau” means lake. In 1867, Nguyen Thong a notoriety and a government’s official was passing by this area, enjoyed the beauty of the lake, gave the name “White Lake” (Bach ho); since then, people combined the “Bau” (Lake) in their own accent with “Trang” (White) as the name Nguyen Thong gave. The two lakes are named Bau Ong (Mister Lake) and Bau Ba (Lady Lake). Bau Ba has more water, is larger with 19m depth in rainy season. People planted lotus in Bau Ba lake making the scene so beautiful and poetic. 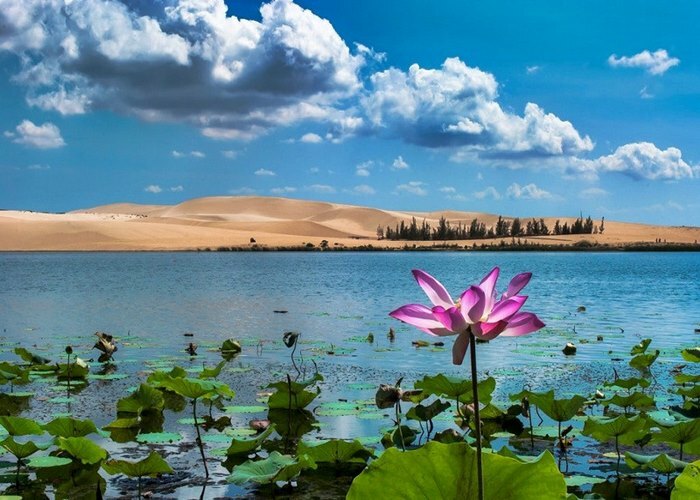 The landscape here is quite surreal – white sand dunes embracing the lotus lake which is like a gentle trait softening the harshness of the endless deserts. 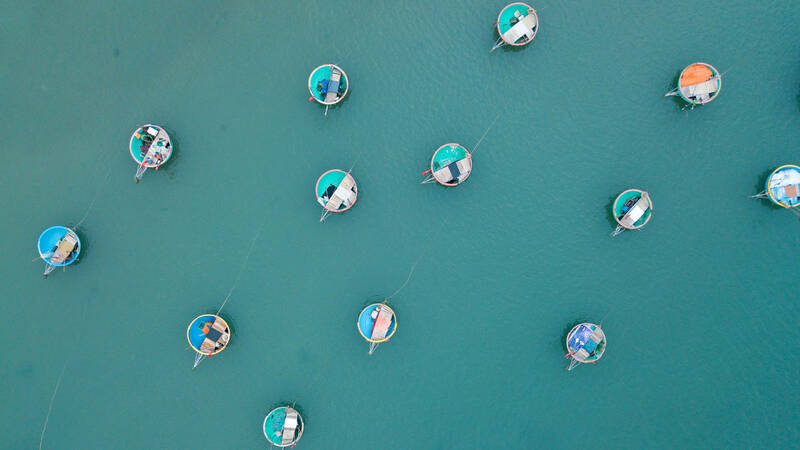 In Bau Trang, visitors can rent boats from locals to go sightseeing or fishing. There isn’t much of service in Bau Trang. 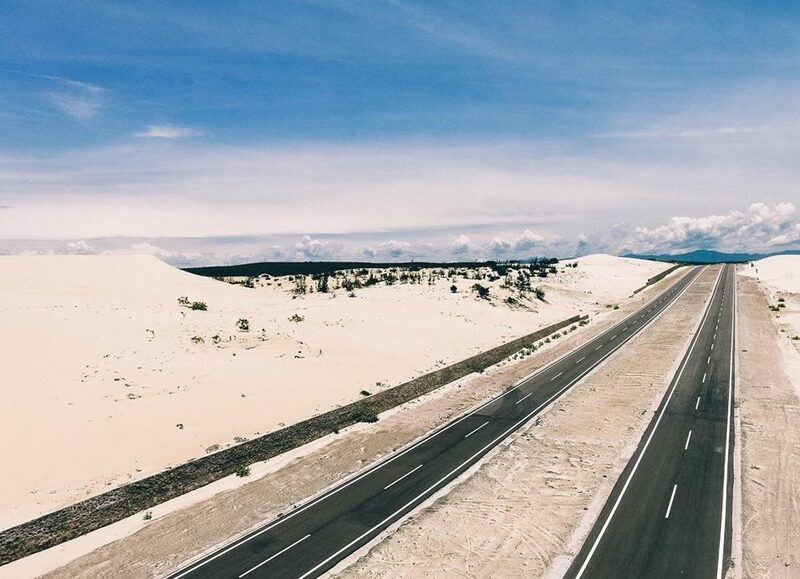 You can spend 500,000VND to rent a 4-seat jeep car or 600,000VND 6-seat jeep car to go to Bau Trang from Hon Rom or to conquer the sand dunes in the north of the lake. 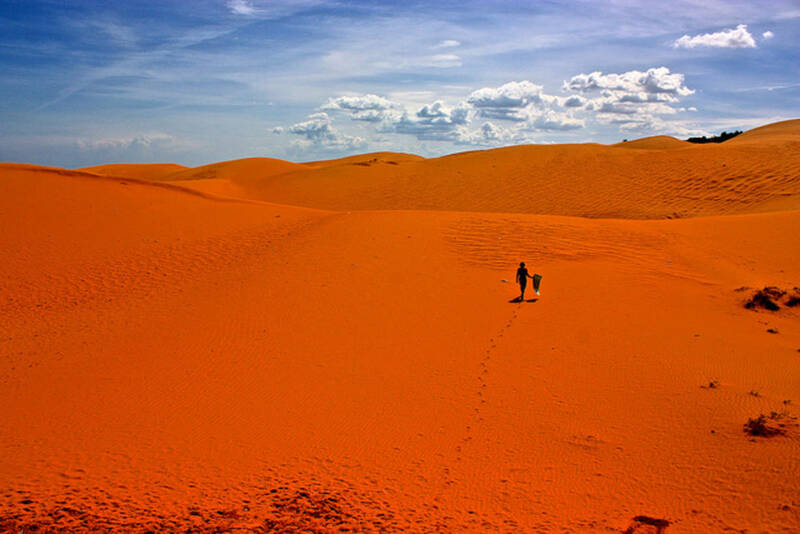 Red Sand Dunes in Mui Ne appeal both domestic and international tourists for its vivid red-orange color under sunlight and views overlooking the blue sea. Hiking the dunes to see the beautiful sea and you can also enjoy the sand sliding down the sand slopes. It’s a fun experience to have in this place. There are a number of activities held in Red Sand Dune in each year. 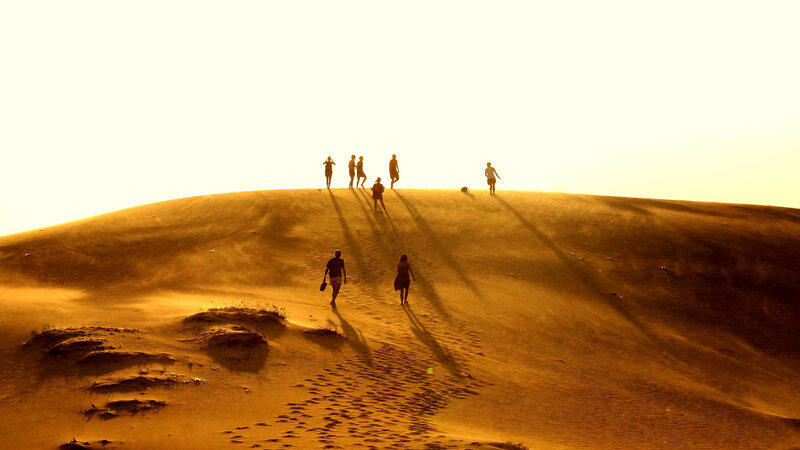 A running race on the sand dunes is held for young people to show their strength, tenacity and will power. 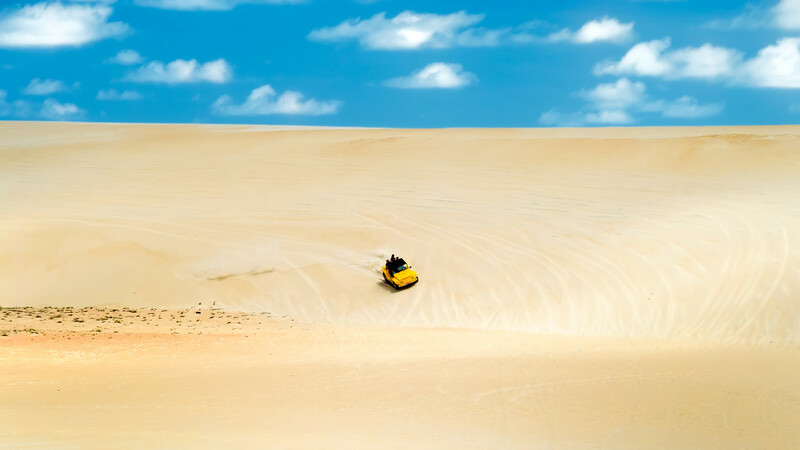 Tourists can participate motor-racing contest across the dunes which is a fun and exciting thing to do in Mui Ne. With a Hot-air balloon ride, you can see all the blue beaches, stretching sand dunes and bustling fishing villages from bird-eye view. 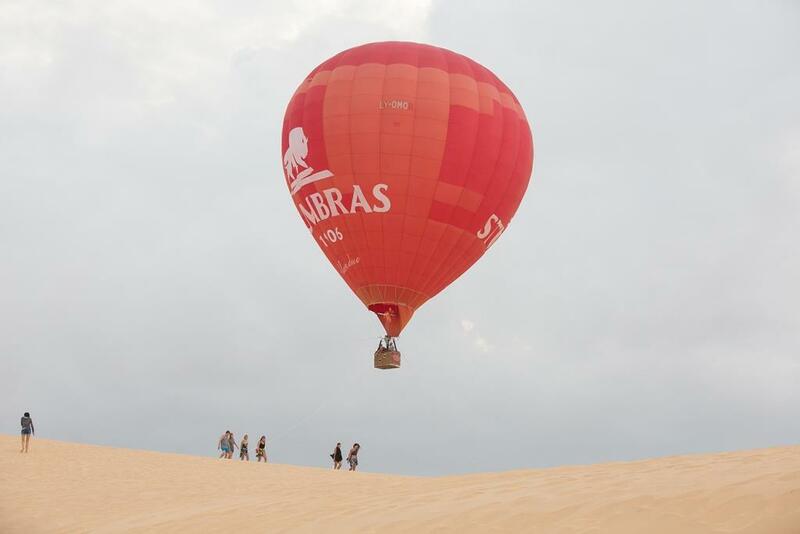 Mui Ne Phan Thiet is one of the few places in Vietnam that have regular hot-air balloon flights. The flight starts from Phan Thiet, takes about one hour and offers plenty of different views of the life in the city and the coastal line. 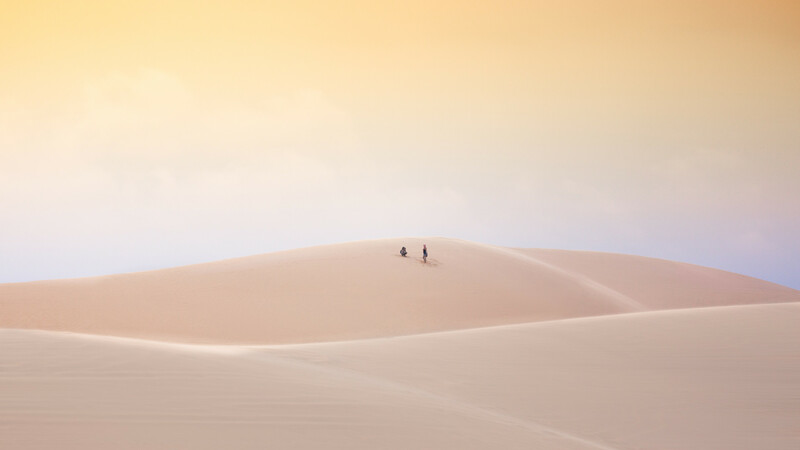 Flight ends at the beautiful sand dunes in Mui Ne where you can enjoy the magnificent landscape of the sands and the sea. The worthiest part of this hot-air balloon trip is you can enjoy the beautiful views from above in the sunrise moment. There are two types of balloons for 6 or 8 passengers, costing about $165 per person (this rate is only available from September – April). Flight depends on the weather. Mui Ne Fishing Village lies at the north of Mui Ne Bay which is about 7 kilometers from Mui Ne Town. Visiting Mui Ne won’t be completed if you miss this incredible place. 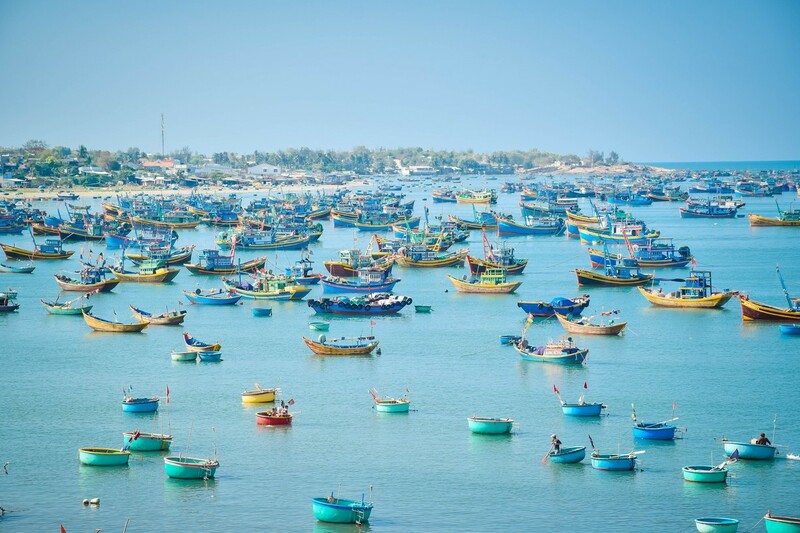 From the coastal road leading to Mui Ne town, you can easily see the blue, protective bay dotted with almost hundreds of fishing boats. Up close, the village isn’t anything like the beach resorts invading all over the place in other parts of Mui Ne. 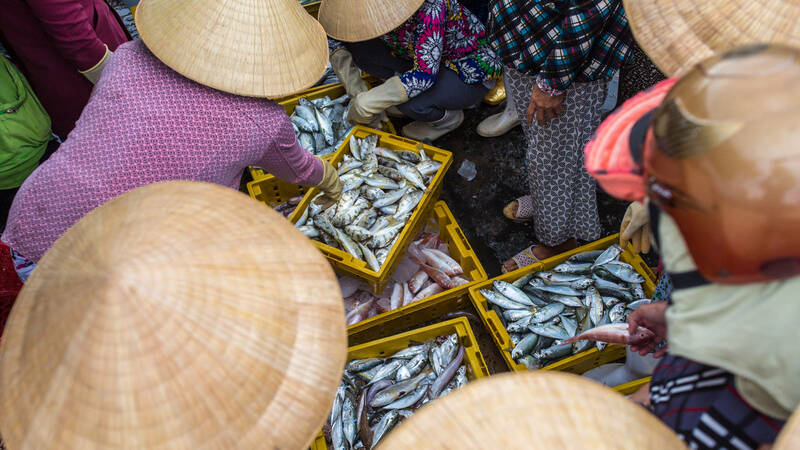 The village is what has been existing here all along, where you can see for yourself the most common traditional activities in any fishing village in Vietnam. In the morning, the villagers come to the beach to wait for the fishermen return from the sea with their boats full of fishes. Everyone is smiling happily in this moment – the men, women and children. You can come here during sunset for great photos of the children playing on the beach, fishermen preparing and sorting out their nets for another catch of the night. The island is about 50 kilometers away from city center of Phan Thiet, has long been known to domestic travelers for its dramatic beauty. The island is small, covered with green trees and white boulders. 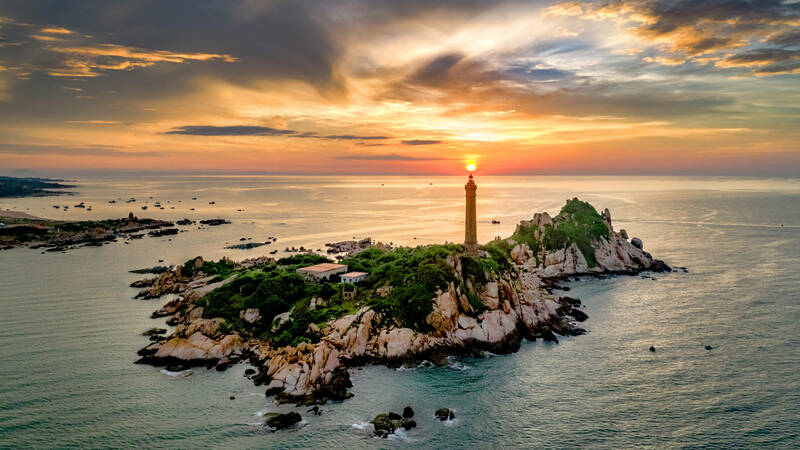 Ke Ga lighthouse, with its age 108 years old and height of 60m above the ground, is the oldest and the tallest lighthouse not only in Vietnam but of all lighthouses that were built in Southeast Asia, ever. This very lighthouse was built by the French in colonialism period to warn the ships out of danger of reefs and the traffic in the area. The lighthouse has typical French architecture with 183 spiral stone steps inside. Once you reach the top of the lighthouse, you’ll be greeted by the immense view of the sea and the sky, especially when it’s sunrise. Phan Thiet City is your base to travel to Mui Ne, blessed with a different beauty than the beach resort paradise. The city lies along Ca Ty River where you can spend the nighttime enjoy the cool breezes to cool off the dry and hot weather of the day. There are a lot restaurants along the riversides, offering a diversity of Vietnamese southern dishes. 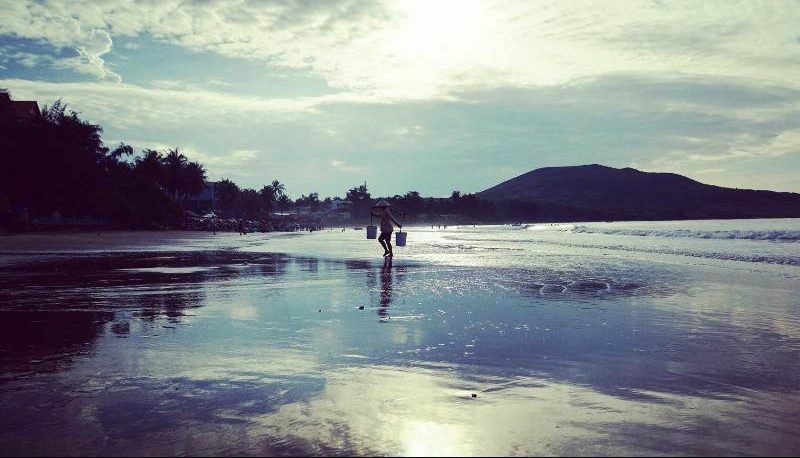 Doi Duong beach which is few kilometers east of Phan Thiet is a wonderful place to enjoy the waves. 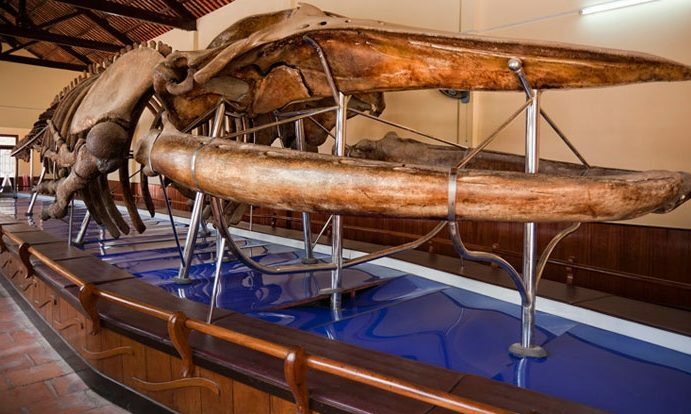 You also want to visit some historical and cultural places in the city like Duc Thanh school – where Ho Chi Minh was a teacher in his early twenties, or Van Thuy Tu Palace, built in 1762 to worship God of the South Sea or Whale God whose existence is believed to shield and protect the ships and the people to keep them safe on the sea whenever there’s a storm. 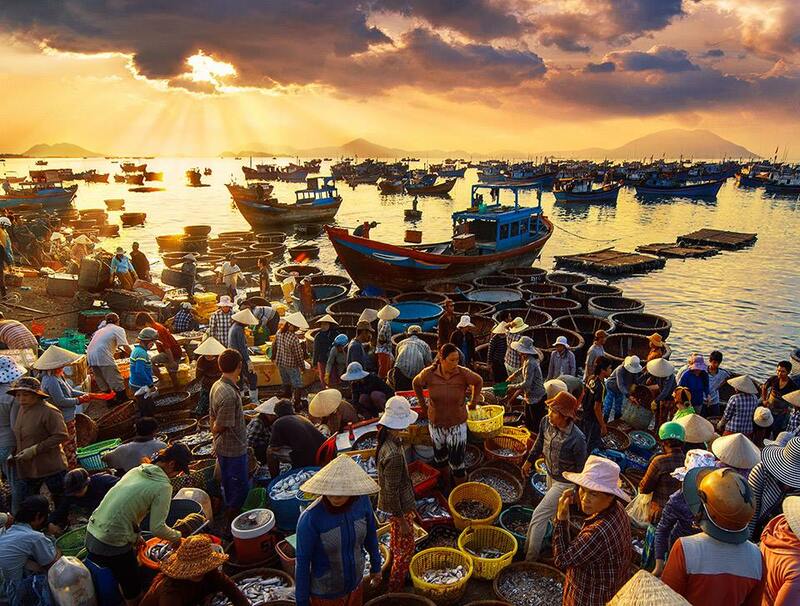 Phu Hai Fishing Village is also an interesting place to visit and enjoy the daily life of fishermen. A gorgeous relic of Champa kingdom in Southern Central Coast of Vietnam. 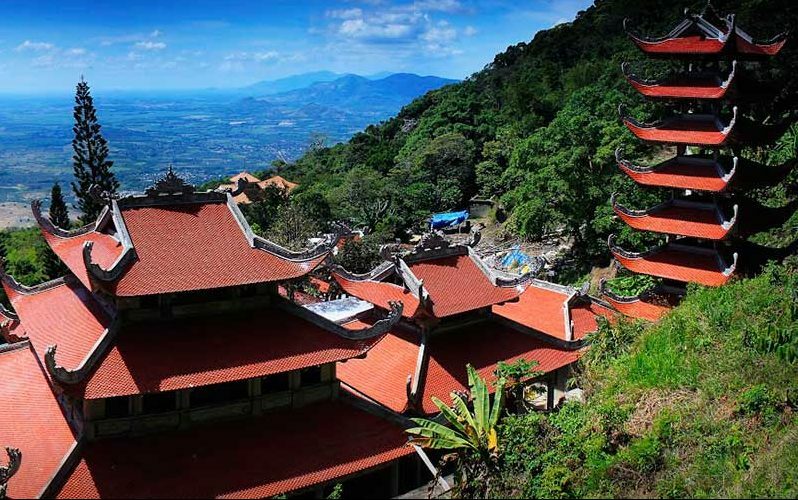 Poshanu Tower-Temple is located 7 kilometers away from the city center, solemnly stands on Ba Nai Hill. This tower-temple is the worshiping place of Shiva and Po Sah Inu Princess. Despite its small scale, this construction represents the distinctive and refined Cham architecture and culture. Ta Cu Mt. peaks at 649m above the sea, and is about 30 kilometers away from Phan Thiet City. 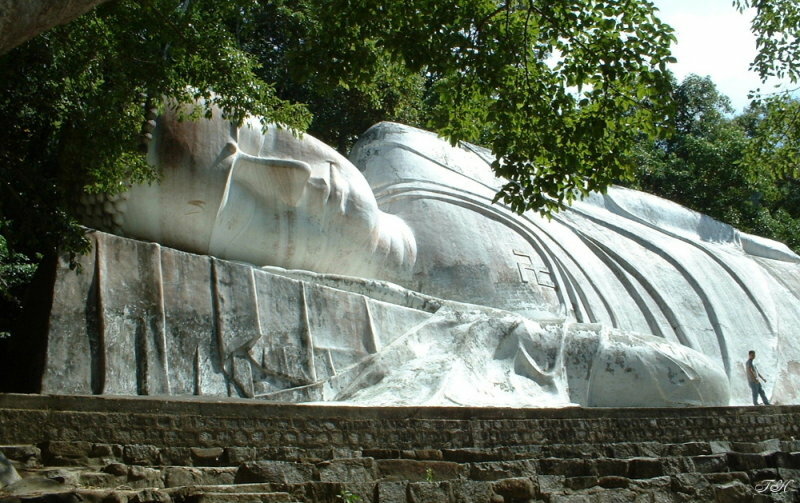 On Ta Cu mountaintop lies the longest reclining White Buddha statue with its total length of 45 meters. To reach the top and see this beautiful statue, you can take a cable car to conquer 1600m-route in just minutes. Or you can challenge yourself on a climb of 2290m on foot. There are two main pagodas here: Upper Pagoda (Ling Truong Son Tho) and Lower Pagoda (Long Doan). The mysterious ‘Cave of Ancestors’ lies underground 100m deep with a narrow entrance and slippery stones. Near the end of the cave, there is a freshwater stream where you can rest after two hours of caving. A shared room is around 550,000VND for 12 persons, an extra bed is 30,000VND. A room equipped with 3 double beds is 350,000VND, an extra bed is 50,000VND. And 2-double bed room is priced 250,000VND. A round-trip cable car ticket for adult is 100,000VND, a one way ticket is 60,000VND. For children, it’s 60,000VND and 40,000VND. The dumpling is made of wheat flour and the filling is made of shrimp and pork. You can’t enjoy the true deliciousness of Banh Quai Vac if you don’t dip these cute dumplings in savory sweet and sour sauce. This is a common dish which can be found anywhere, from vendors to luxury restaurants. Don’t miss it out! The name of this dish must have made you question: do squid even have teeth? No, the ‘teeth’ is actually the round part on the head of the squid, often removed because people think it’s inedible. 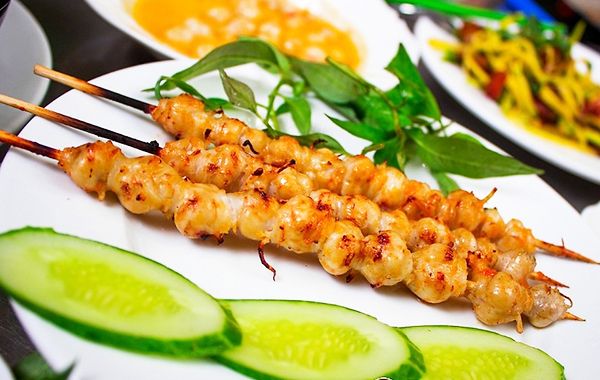 However, in Phan Thiet and Mui Ne, this dish has become a specialty you can’t find anywhere else. The squid teeth are skewered and barbecued until they turn yellow. Served with chili sauce and enjoy. 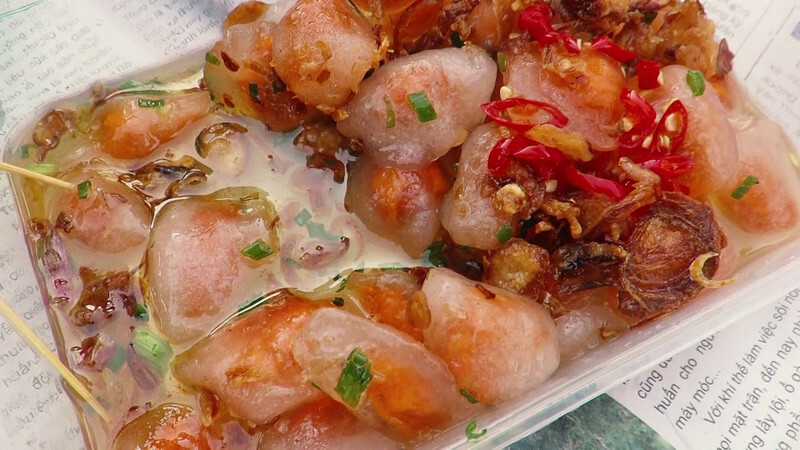 It’s a pity if you miss try this dish when you visit a coastal city in Vietnam. Big squids are washed to make them less salty and dried in the sun. The name ‘one sun’ means that the squids are dried under sunlight in one day. This makes the squid only dried on the outside but the inside still fresh and squishy. 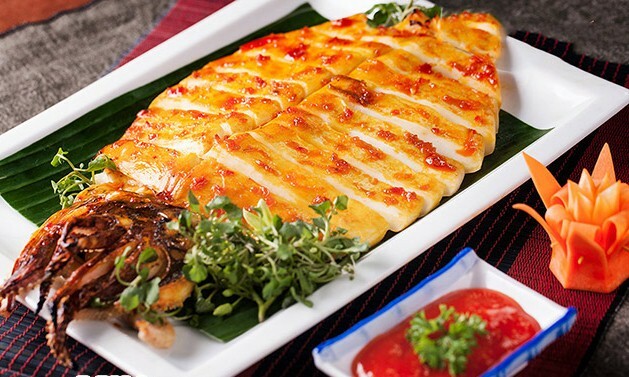 ‘One sun’ squids should be grilled on a charcoal fire until the color turn golden and the meat produce nice fragrance. This dish is best when eaten with a cup of cold beer in the afternoon, after a swim in Mui Ne Bay. 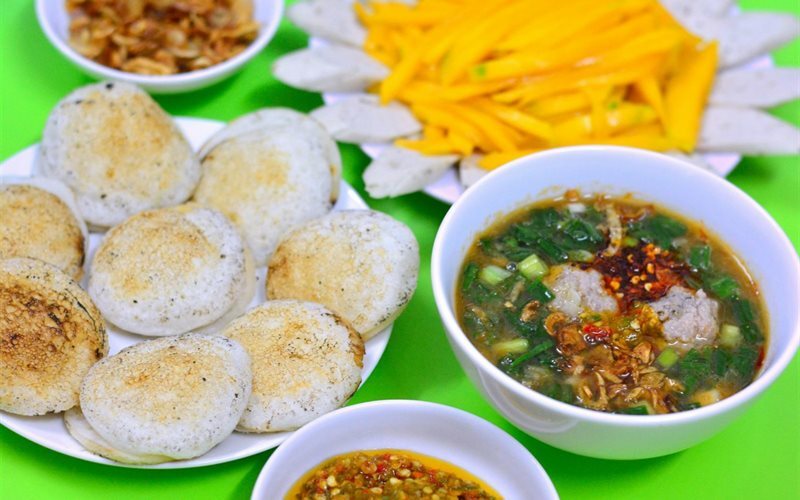 This dish is very popular in Central Vietnam. The cakes are round and small, made by rice flours, topped with shrimp, squid and spring onions. The fillings are the things Vietnamese people can be very creative about. Get to Mui Ne to see what Mui Ne people use to make Can cake’s fillings! 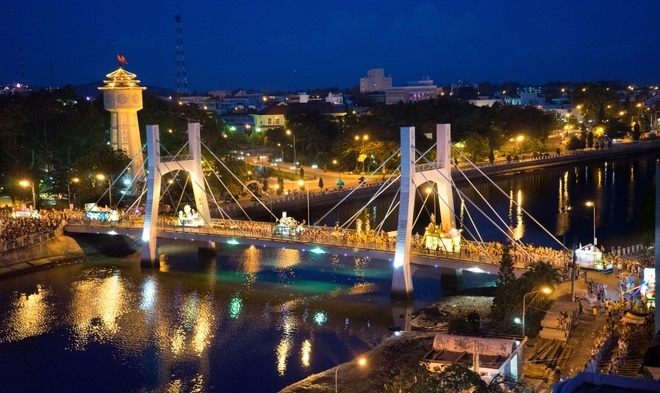 Mui Ne belongs to South Central Coastal province Binh Thuan which has a provincial city Phan Thiet. 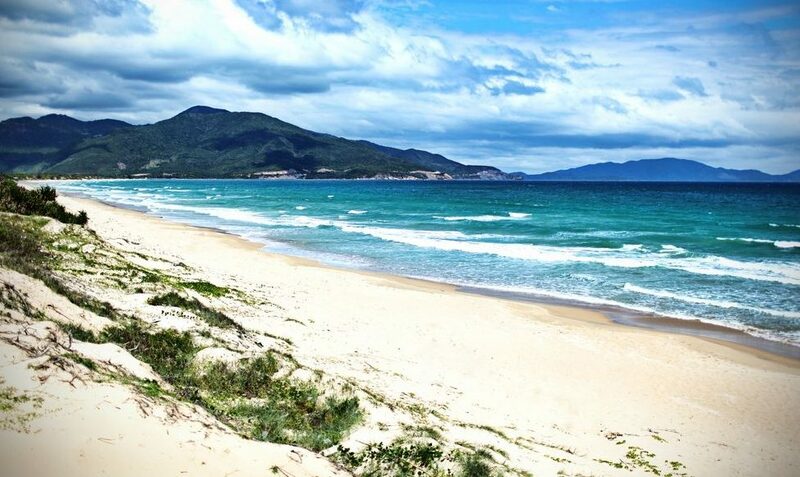 Binh Thuan is about 200km away from Ho Chi Minh City, 250km south of Nha Trang and 1518km from Hanoi. 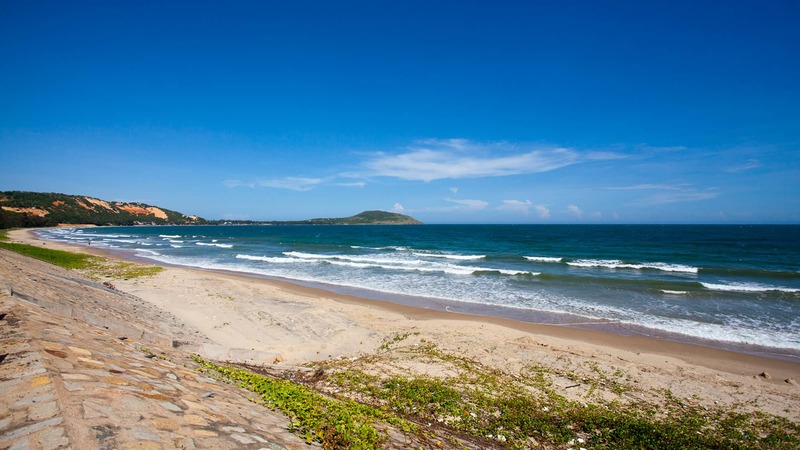 The coastline of Binh Thuan is 192km. 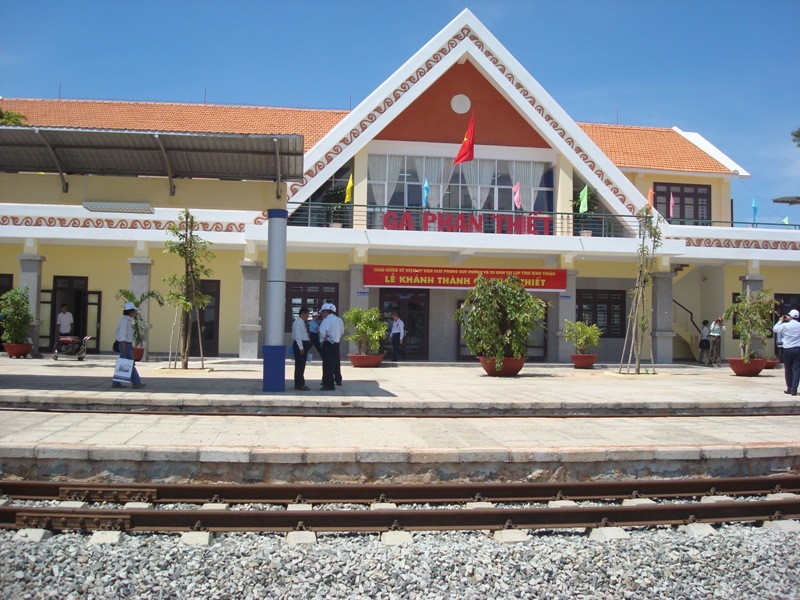 By Train, there is a train which starts from Ho Chi Minh to Phan Thiet’s railway station available everyday at 7:05, one more afternoon train in the weekends. The time traveling by train is now reduced to 4 hours. Price ranges from 150,000VND to 200,000VND. You can also bring your motorbikes or scooters along by paying the transit fee (for the bike) of about 150,000VND. By Bus, there are plenty of buses to Mui Ne and Phan Thiet from across the country. From Hanoi, you can catch straight route to Phan Thiet with Mai Linh express at Nuoc Ngam bus station, expect to pay from 700,000VND – 800,000VND. You can take a flight to Da Lat or Ho Chi Minh then catch bus to Phan Thiet. From Ho Chi Minh, buses are much cheaper, to Phan Thiet, it’s only 85,000VND. Buses from Da Lat cost more, about 100,000VND – 250,000VND. By Plane, from Hanoi you can take flights to Cam Ranh (Khanh Hoa)/Da Lat/Ho Chi Minh City then take bus to Phan Thiet. From Phan Thiet, you can rent a motorbike, take a local bus or book a tour to Mui Ne. For motorbike renting, the cost is about 150,000VND per day per bike, not inclusive of fuel cost. For local buses, Bus 1 and Bus 9 both stop at Mui Ne, costing 10,000VND and 18,000VND per way respectively. The best time to visit Mui Ne from October to November and from April to May. 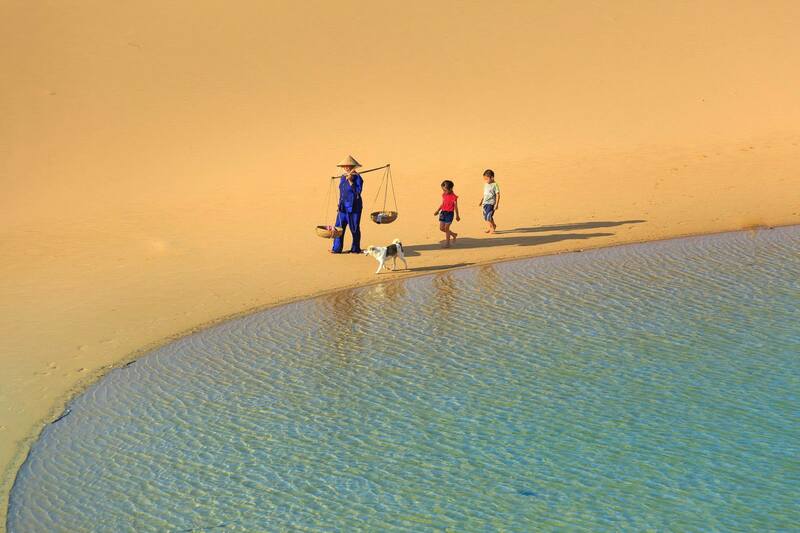 Other months are also not bad time to visit Mui Ne since Mui Ne is located in drier region than other places. Expect the weather in Mui Ne is hot, sunny and breezy.